This is one brutal Haggadah. I ran into it in Marc Epstein’s new book on the medieval Haggadah. It is the so-called “Brother Haggadah” to the more famous Rylands Haggadah. It’s presumed to be 14th C. Catalonian. 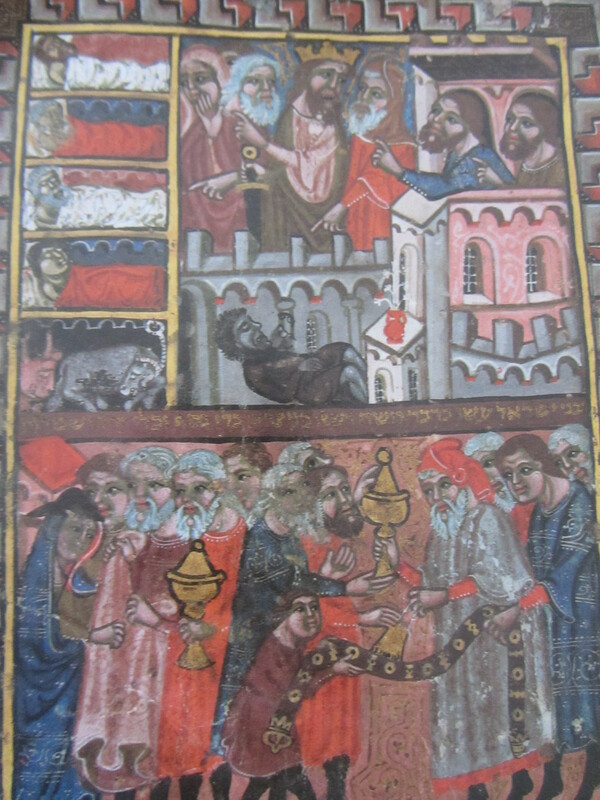 The figures in the Brother Haggadah are both bigger and more “primitive” than the ones that appear in the Rylands. I like in particular the hand gesticulations, how all the main characters are pointing, almost desperately, this way and that. This entry was posted in uncategorized and tagged Jewish art, Judaism, Passover, religion, Shabbat & holidays. Bookmark the permalink.